Rosedale is a rural town on the Princes Highway, Gippsland, midway between Traralgon and Sale. It is 170 km south-east of Melbourne. The Latrobe River, one of several flowing into the Gippsland Lakes, is just north of Rosedale. Pastoral runs occupied the lightly timbered plains on the Latrobe River from the early 1840s. The Snakes Ridge run, taken up in 1842, extended north and south of present Rosedale. Rosedale run was to the west and Holey Plains to the east. The locality and a creek became known as Blind Joe’s Creek, named after a shepherd who lived just east of present Rosedale. By the late 1850s there was a store, hotel and blacksmith, the inhabitants being mainly employees of Snakes Ridge run. The little settlement took the name Rosedale from the nearby run, which was named after the leaseholder’s wife. A track from Port Albert, the main entry point into Gippsland, passed through Rosedale, intersecting with the route from Melbourne to Sale. In 1862, a bridge replaced the punt on the Latrobe River. Rosedale soon became an important junction for coach services, transporting miners and supplies to the newly discovered goldfields in the Great Dividing Range to the north. The town grew rapidly, becoming the third most important in Gippsland. Numerous businesses were established. There were three hotels, bakers, butchers, saddlers and blacksmiths. A school was established in 1863 and there was a court house, police station and Anglican (1866), Presbyterian (1869) and Catholic (1874) churches. A mechanics’ institute was formed in 1863 and a brick hall was built by 1875. 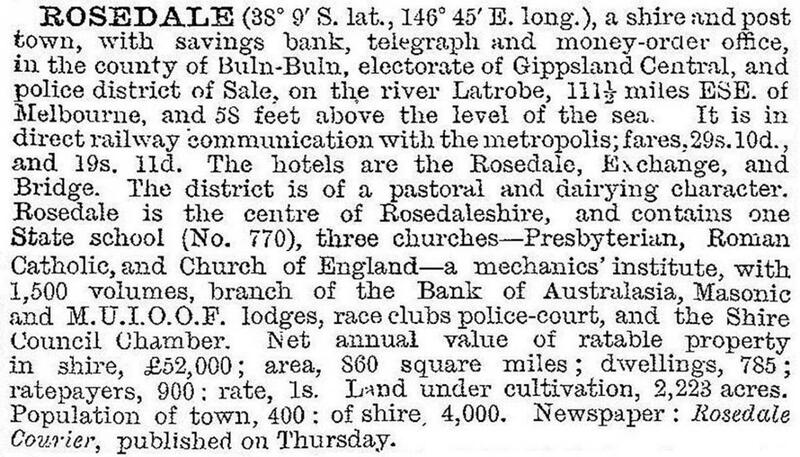 Rosedale Shire was proclaimed in 1871 and Rosedale was the seat of government for this large shire which extended from the coast in the south almost to the Great Dividing Range in the north. The railway line from Melbourne to Sale passed through Rosedale in 1877. But Rosedale derived no benefit. While nearby Traralgon and Sale expanded, Rosedale suffered from proximity to these centres, and was no longer one of the main Gippsland towns. Coaches from the goldfields ran to the rail heads at Moe and Traralgon, and later Toongabbie, causing the services from Rosedale to decline. Most land in the district had been settled by 1880. Most of the natural timber was milled, clearing land and supplying the tannery established in 1868. The fertile soil produced crops of wheat, oats, potatoes, peas and beans. Grazing and dairying were also important. Rosedale remained a small country town of about 500 residents, serving the surrounding farming community. After severe floods in 1934, a new long bridge over the Latrobe River replaced the original two bridges and causeway. From the 1960s Rosedale experienced some growth. Developments in other parts of Rosedale Shire increased the administrative importance of the town. From 1964 a factory manufactured particle board. More housing for the increased population was necessary, much provided by the Housing Commission, and this growth stimulated the business sector. After the closure of the particle board factory about 1979, people living in Rosedale transferred to jobs in the Latrobe Valley or at the oil and gas processing plant near Sale. With shire amalgamations in 1994, Rosedale is no longer an administrative centre. In 1996, a large new bridge was constructed over the Latrobe River. Holey Plains State Park (1977), south of Rosedale, is an area of banksia/eucalypt woodland, low sandy hills and swamps where the diverse vegetation, particularly wildflowers, is preserved. Rosedale has kept many of its original buildings, including the mechanics’ institute on the Princes Highway (the main street) and the common school (1870). The shire hall in Lyons Street is occupied by the historical society. Heritage listed buildings include the Rosedale Hotel (1858) looking down the Princes Highway, the Anglican church and the railway station (1881). The State primary school (1989) adjoins a recreation reserve and indoor sports complex. There is a motel (1970) at the western end of the town with Spanish-style buildings, dating from the time when Rosedale’s equable climate annointed the district as the ‘riviera of the south’. The motel closed in 2013 and was auctioned the following year. The Wellington Shire Council adopted the Rosedale Structure Plan in 2012 to guide the town's development over 15-20 years. Rosedale primary school had 114 pupils in 2014.